Being a bit silly with that headline… what the H farms though is what we are talking about, several farms that have an H central to the farm name. 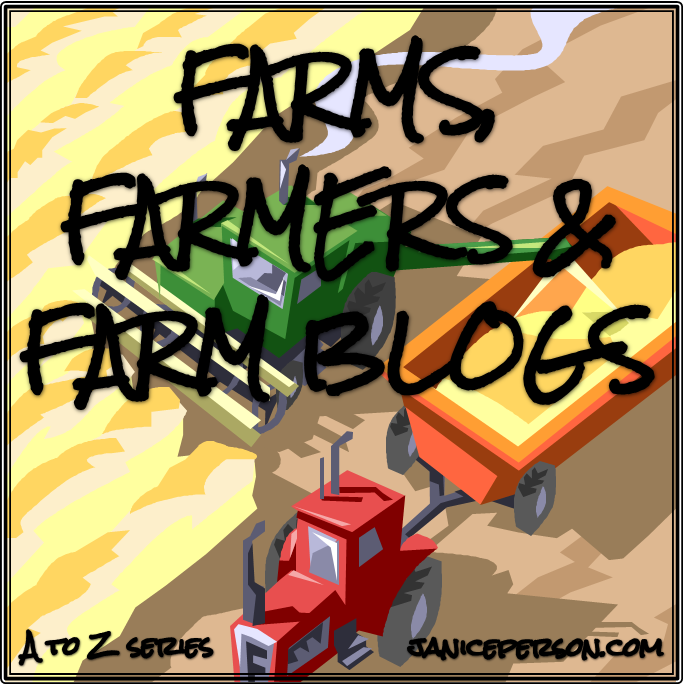 The latest in the farm A to Z challenge. Today’s post highlights several farms, including a couple I visited in the past year but hadn’t gotten around to writing about quite yet. That’s part of what makes this series so awesome! It wasn’t that long ago that I’d have been unable to name a single dairy farmer but social media totally changed that! It’s through AgChat that I met Jennifer Heim. She and her husband David run Heim Dairy Farm LLC in Easton, Kansas not far from Kansas City. As a dairy, the main commodity we sell is milk. Most is sold in fluid form, but a small percentage is made into ice cream. We also sell some animals as beef. We milk Holstein cows (the stereotypical black and white ones) and raise all of our female calves to be replacements in our milking herd. On our crop land, we primarily raise corn, sorghum, hay, and other forage crops like alfalfa and rye, all of which we feed to our cows and calves. The only crop we sell is soybeans, which we plant a small percentage of every year as a rotation crop. How did you get into agriculture? My path into agriculture was pretty round-about. I grew up in a small town in Illinois, familiar with agriculture but not really all that involved. My grandparents were farmers, which means I got to do all the fun things that come with a farm and was required to do very little work in return. When I graduated high school, agriculture was the furthest thing from my plans. I went to a large university in a small city and majored in engineering. Five years and two degrees later, I took an engineering job in Kansas City, living and working in an urban environment. Shortly thereafter I met my dairy-farming husband and fell in love with both him and his cows. In 2012, we took the opportunity to take over his family dairy operation, and I found myself (sometimes literally) knee-deep in ag. I do still work off the farm in Kansas City, but I have several roles and responsibilities at the farm, and I treasure the time I get to spend working with my husband and our cows. What is the best thing about farming? It’s a little bit difficult to explain, but I love the different lifecycles and the connections between them. In so many jobs, you’re involved in one part of the lifecycle or process, but in farming – it’s all your responsibility. An example with our crops: We fertilize our ground and plant crops, watch them grow and harvest them. We then feed them to our cows who use them to produce milk and more fertilizer. Similarly, an example on the cow side (more my specialty): we breed a cow, she has a calf, we feed and care for that calf, breed her, and she becomes a cow, and the cycle continues. We see the results of almost every decision we make, even if that result is years down the road, and all aspects of our operation are interconnected, each having an effect on the others (you can see that in the examples I gave). It’s pretty cool to see how it all fits together and to observe how those cycles continue. One of the first farmers I got to know online was Mike Haley and he will forever hold the distinction of being the first one I traveled to meet up with! He and his wife Pam have a cow-calf operation, which as far as I can tell means they are really smart about cows and their genetics. They have cows and bulls and have been building their herd since I met them at the North American International Livestock Exposition. 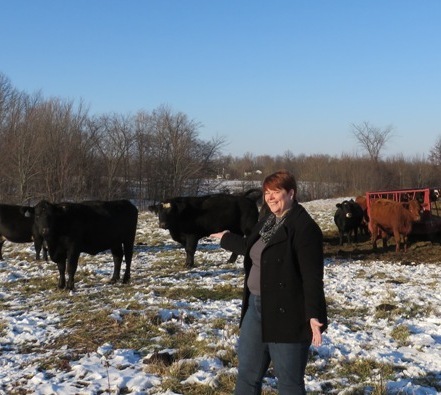 They raise a breed of cattle called Simmental and taught me a decent amount about them (though I know NOTHING compared to Pam!). One of the things that stands out when folks like me look at breeds of cattle is color. I know, it sounds goofy but we all know that color catches the eye. 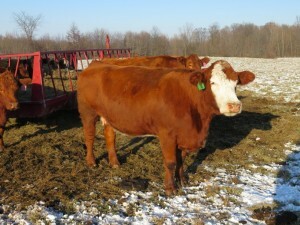 Simmentals tend to be black or red — at least most of the one’s I’ve seen are. My favorites are the redheads but I have to admit that once Pam taught me about baldys…. they are the ones with the great patterns of white on their faces. So for me, a red baldy is the best! This is a shot of one of their baldys I captured when I FINALLY got to their farm in November after years of being friends and meeting up in various states. It was a quick visit but a great one! 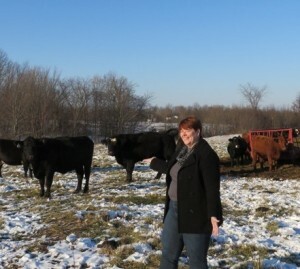 And yes, I had time to frolic on the pasture and even did a feat of strength lifting a Bull Named Sue with one hand! Matt is one of the folks I have worked closely with at Monsanto and last summer I had the chance to meet up with him and go to his family farm just across the Mississippi in Illinois. That’s where I met his dad Dale, mom Jane & brother Fred! I have to admit it was really fun to see a whole other side of Matt, cause while I have talked to him while he was on his way to the farm to help out and had him tell me about various things his dad and brother are doing, I’m such a visual thinker that getting my feet planted on the soil the family farms, really sticks with me. 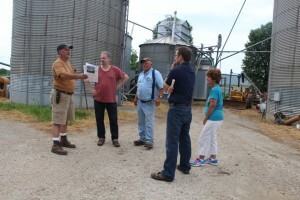 They grow corn and soybeans and have been farming in the area for generations. I loved seeing the excitement that Fred generated as he talked about last year’s yield trials and what corn hybrids and soybean varieties worked best on the soils, in the 2014 weather conditions, etc. He talked a friend through all of the various pieces of equipment, what this one piece did and how this monitor helped him stay on top of information. 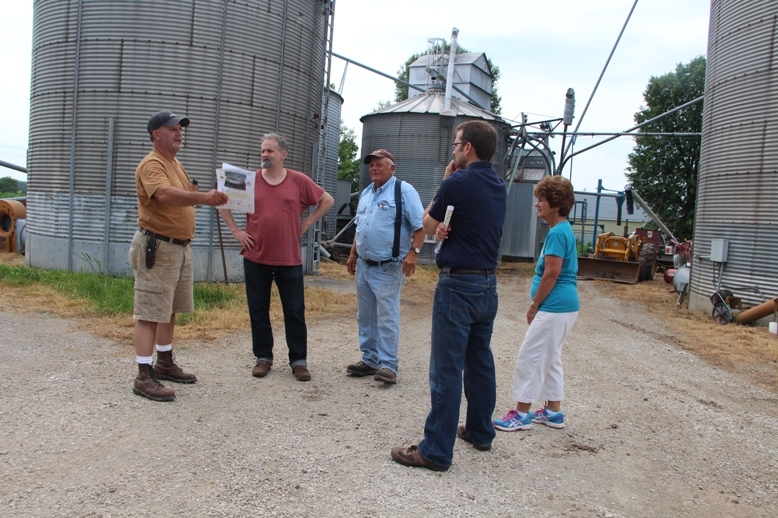 He talked about how they managed grain on-site and more. And in the meantime, Dale was busy telling me about the farms history. He mixes lots of laughs with things that make me think there should be an oral history project underway. Dale talks about how the family came from Europe and went into New Orleans before coming up the river and finally finding a place to settle and build a farm. Over the years, Dale says the number of farmers has dwindled as more and more people migrated to cities. It’s happened more in the past few years too as folks his age retire and not everyone has a son like Fred who’s passionate about farming or Matt who chose to work in agriculture nearby. The Helms don’t have social media but that’s fine. Social media isn’t for everyone, but I have to tell you, Dale could do a rockin series of videos on history of the area! Maybe I should check back in on that with Matt! So many of these farms & families are near and dear to my heart. 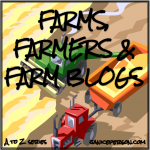 I hope you are enjoying the Farms, Farmers and Farm Blogs A to Z. And we are just in week two! Lots more coming this month! You can subscribe to the blog to get future posts without visiting the site. 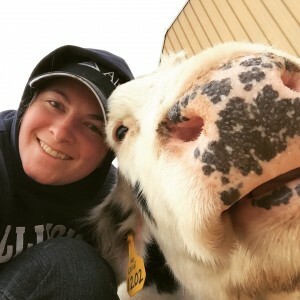 And if you want to find even more great farms, check out this list of farm blogs and search for some keywords or just start someone and get moving!